"Neumatic Notation on Computer" was my Senior Project at Yale College (of Yale University) in the spring of 1995, when I returned there to finish my B.A. degree in Music and Computer Science. and to adapt a commercial music-editing program to work with that font. My supervisors on this project were Prof. James Grier (of the Yale Music faculty) and Prof. Peter J. Kindlmann (of the Yale Electrical Engineering faculty). • Project Proposal outlines steps for realizing the project, tools that would be used, and how they would fit together. • Technical Documentation: Creating a Font File outlines steps for creating a neumed font for Windows (can be adapted for other platforms). • Technical Documentation: Table of Correspondences lists cell numbers in the font and a description of the corresponding characters. Personal Composer ™ is the music editor that was used for this project. It was written by Jim Miller in the LISP programming language and was the first commercially-available music/MIDI editing program. It is recognized today as "the easiest to learn and use of all the full-featured music software products." • Discussion of commercial music-editing programs. See also, Glossary of Musicological Terms, and a definitions of two special terms involved in creating fonts. 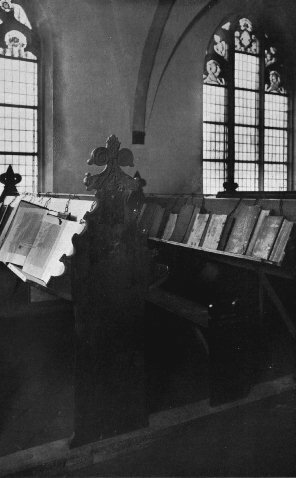 Lecturns in an ancient pattern at the Church of St. Walpurga (Zutpher, Holland; built 1561-3); photo reproduced from Burnett Hillman Streeter, The Chained Library, (London: Macmillan, 1931), p. 11.